Thailand gained independence from Khmer rule shortly after Sukhothai was first built in 1238, beginning the country's history. During control by its third ruler, Sukhothai's ruler gained power over an area larger than Thailand today: Thailand, Myanmar, present-day Laos, and along the Malay Peninsula. The name Sukhothai is directly translated as "Dawn of Happiness." Within Sukhothai is Thara Wasan Cave, a popular place for treks to explore centuries-old stalactites and stalagmites. Sukhothai Thailand is an ancient kingdom in Ayutthaya, the north-central region of the country. It is a UNESCO Heritage Site and an imperative historical park. Passing power through three rulers, Sukhothai rose from having little power to great authority less than a decade after it was founded. History spanning the kingdom’s active existence is often considered the beginning of Thai history. Sukhothai Thailand has tremendous history paramount to the foundation of old Siam (Thailand). The kingdom, established in 1238, was the first Thai kingdom in existence. The roots of ornate and influential Thai architecture stem from Sukhothai as do cultural facets associated with Thais today. 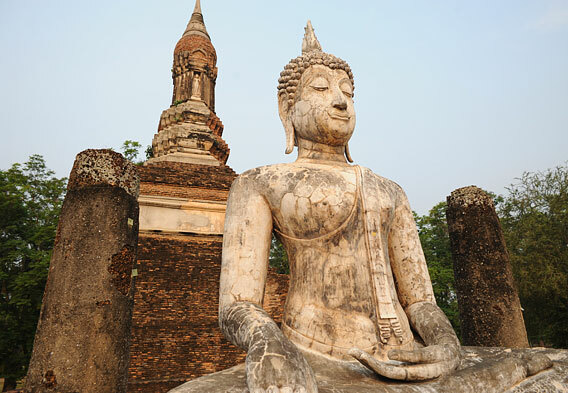 Featuring numerous magnificent monuments, Sukhothai is where Thai civilization first evolved and where Hinduism and Buddhism often met in the earliest years. Before the kingdom, the region was governed by Khmer powers. Original settlers from China’s Yunnan province, called Thai or Free Men, settled in the northern reaches of present-day Thailand, banding together in small settlements. A Thai prince wed an important Khmer female and rebelled against dominant Khmer powers. 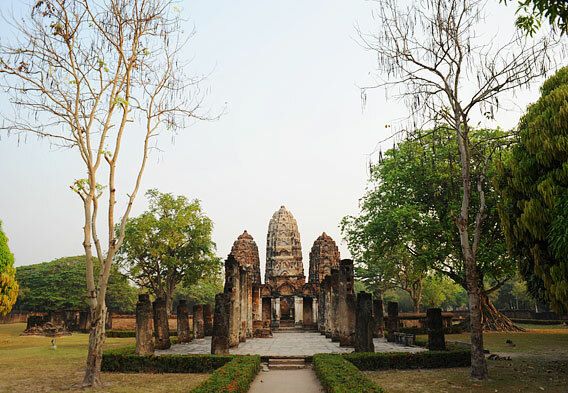 This led to the creation of the first Siamese capital, Sukhothai, named after the capital city. The founder’s second son inherited great influence and gained extensive lands through numerous military triumphs and also created the Thai alphabet and imposed strict adherence to Buddhism. Khmer influences are strongly recognizable within the kingdom’s monuments and also played a part in influencing social organization within the Thai kingdom. The ancient Buddhist temple Wat Mahatat is north of Bangkok’s Grand Palace and one of the few royal temples in Bangkok. Wat Mahatat is one of the most important of all sites within Sukhothai Thailand. It is encased by a moat with two primary areas: the palace sanctuary and the royal building. Wat Mahatat is to the palace’s west, the biggest of all Sukhothai temples with a traditional lotus-shape and chedi (or stupa) and an ancient viharn (sermon hall). Adoring disciples worship Buddha from the chedi base flanked by images of Buddha seated around the pedestal. A main feature is the bronze image of Buddha, sculpted and positioned in 1362 by King Lithai. Wat Sa Si is located inside Sukhothai Historical Park on the northwest side of Wat Mahatat and on an island in the center of Traphang Trakuan pond. The bell-like stupas are Sri Lankan, indicating Sukhothai architectural style with a heavy Singhalese Buddhist influence. Main features are the ordination hall, displaying a demarcated area for performing religious events by encasing holy quarters with water, symbolizing purity. Set on the east side of the National Museum, this ancient monument was built within the Tra Phang Thong reservoir. The temple is enveloped by eight chedis and features a prominent ordination hall rebuilt only 90 years ago. Today the building is mostly in ruin with only stone columns and the pedestal remaining. Wat Tra Phang offers some of the best scenery of surrounding temples. Wat Si Sawai is one of the smaller temples within Sukhothai on the southwest side of Wat Mahatat. The main features are three ornate towers in Khmer-style architecture. Like several surrounding ruins in Sukhothai, Wat Si Sawai originated as a Hindu temple and was later changed to a Buddhist monastery. The small religious building adjacent, called a mondop, holds Buddha’s stone footprint, a feature worshiped by local monks today. 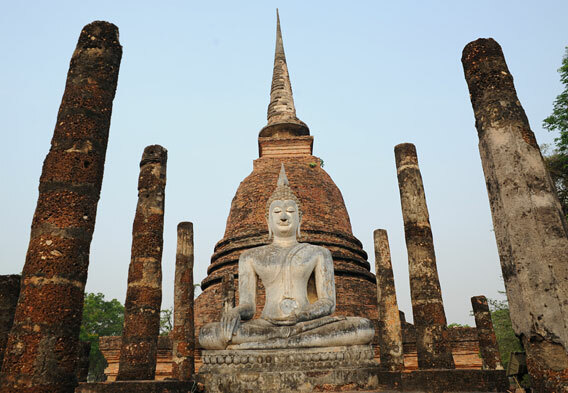 Due to the regional importance of Sukhothai Kingdom there are several important sites that go hand in hand with it. The twin waterfalls of Tat Dao and Tat Duan are main attractions in the thirteenth-century city of Si Satchanalai National Park along with two magnificent caves: Tham Thara Wasan and Tham Khang Khao. Called the Twin City of Sukhothai, Si Satchanalai is also a UNESCO World Heritage site lying roughly 23 miles north of modern Sukhothai on the banks of the Yom River. Historical sites and natural attractions abound within Ramkhamhaeng national park. It is home to a variety of caves, several beautiful waterfalls, and an array of unique flora and fauna. Ancient ruins and archaeological artifacts are also available for viewing. Also called Khao Luang, the park is roughly thirteen miles from Sukhothai Historical Park reached via Highway 101.